The Foundation Update has arrived and is available now to download for PS4 and PC. As expected, you can build bases of your own on planets, and there are new creative and survival modes for changing the emphasis of the game. You can also recruit alien lifeforms to develop your technology, set up a farm to grow your own resources, set up save points and waypoints, and buy huge interstellar freighters for storing all your kit. New resources have been added and the interface has been cleaned up too. Visit the Hello Games site for a full rundown of all the new features. If you're still playing No Man's Sky, we've got news for you - the first major update for the game is on the way, and base building is going to be an important part of it. Details are pretty thin on the ground, but judging by a post on the Hello Games website, you'll be able to start carving out a spot or two in the galaxy to call your own. The update is scheduled to drop sometime this week. "We're calling it The Foundation Update, because we have added the foundations of base building, and also because this is putting in place a foundation for things to come," writes the Hello Games development team. 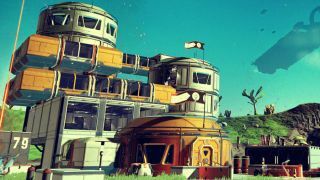 It's a welcome bit of news from Hello Games, as the beleaguered studio has been under the spotlight since No Man's Sky launched in August - and upon release the vast space exploration game wasn't quite what everyone was expecting. "It won’t be our biggest update, but it is the start of something," Hello Games says. "This update will be the first small step in a longer journey. We hope you can join us." The studio didn't address some of the criticism levelled at the game directly, nor did it reveal much in the way of details about the No Man's Sky update, so we'll have to wait and see what's included when it arrives this week.